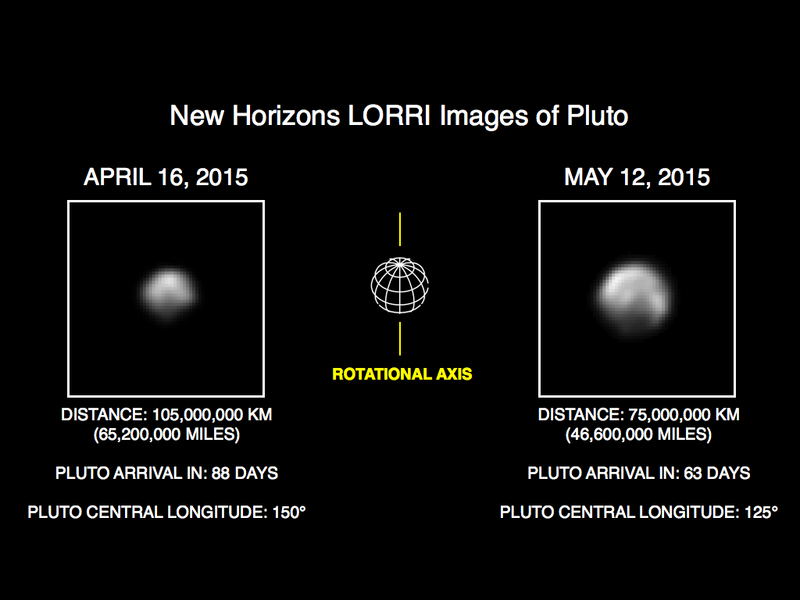 The image of Pluto on the right is part of series of New Horizons Long Range Reconnaissance Imager (LORRI) photos taken May 8-12, 2015; the image at left shows LORRI’s view of Pluto just one month earlier. In the month between these image sets, New Horizons’ distance to Pluto decreased from 68 million miles (110 million kilometers) to 47 million miles (75 million kilometers), as the spacecraft speeds toward a close encounter with the Pluto system in mid-July. All of the images have been rotated to align Pluto's rotational axis with the vertical direction (up-down), as depicted schematically in the center panel. Between April and May, Pluto appears to get larger as the spacecraft gets closer, with Pluto's apparent size increasing by approximately 50 percent. Pluto rotates around its axis every 6.4 Earth days, and these images show the variations in Pluto's surface features during its rotation. These images are displayed at four times the native LORRI image size, and have been processed using a method called deconvolution, which sharpens the original images to enhance features on Pluto. Deconvolution can occasionally add "false" details, so the finest details in these pictures will need to be confirmed by images taken from closer range in the next few weeks. All of the images are displayed using the same linear brightness scale.